Steven Butala: Today Jill and I talk about this topic, where does this business model end? Jill DeWit: Oh, I have a road map. Jill DeWit: I made a road map. Steven Butala: … a question by Jermaine. Jill DeWit: Oh, exit strategy. Oh yeah. Jill DeWit: Got it. I forgot about that. Jill DeWit: Marcus asks, “What should I be doing while waiting for my first mailer to hit?” It’s good. Jill DeWit: Yep, and you’re sweating it. Steven Butala: … to get it to where they’re opening the mail, potential sellers are actually opening the mail in the office, so he’s asking. Jill DeWit: I’d start getting ready. Get your systems in order. Jill DeWit: Yeah, he does. Jill DeWit: He does that, too. It’s so funny. You’re right. Steven Butala: Jill laughs every time. Steven Butala: To this day. Jill DeWit: “How many times do I have to tell you? You did it right. I promise,” and then another week goes by and we’re overwhelmed. Steven Butala: We’re buying dirt. Jill DeWit: Yeah, and he’s like, “Oh sorry, yeah, I guess I overreacted there, didn’t I?” Yeah, you kind of did. Steven Butala: Everybody wants something to just smack them in the face and for it to be great and easy. That’s how we all want our lives to go. Steven Butala: This is easy and great and profitable. Jill DeWit: “I don’t have to do any work.” That’s right. All right, so let’s go ahead. We’ll talk more about what we think I kind of did, but some of our members put in some replies, so I’m gonna read some of the responses. Steven Butala: I couldn’t have answered that better myself. Jill DeWit: Something like that, too. Steven Butala: Tiny house people. Jill DeWit: Exactly. Get yourself in those groups. Steven Butala: This guy’s brilliant. Jill DeWit: Thank you, Robert. This is great. Steven Butala: Brilliant people in this group. Jill DeWit: I think that was awesome. Steven Butala: And don’t freak out. Jill DeWit: Yeah, don’t freak out. I was just gonna say too, you know you’re gonna be buying some property. You know the area. You know how the county works. You know you’re gonna be doing special warranty deeds. Start prepping up and being ready to do deeds. Start prepping up and being ready to post a property when you buy it. Jill DeWit: He’s talking about the marketing property, but we still gotta buy the property. Make sure you know where to go to do your due diligence. Get familiar in parcel fact, so when people call you up, you’re going to parcelfact.com, you’re popping in the state, county APN. Get practice looking it up and looking at the properties and getting to know the area a little bit better. What else do you want to add? Steven Butala: Yeah. So when there’s downtime like that, specifically for info lots or for houses, you need to find buyers. Jill DeWit: Yeah, the flippers. Jill DeWit: What you’re gonna do with them. Steven Butala: You should now who’s gonna buy the property. Steven Butala: You should have maybe a list of five people at least that are already buying property in that area anyway. Jill DeWit: You know what’s funny about this? It reminds me of the first time being pregnant. We all, men and women, okay, when your significant other is pregnant, what do we all do? We study all the books about pregnancy, about the pregnancy, what’s growing, how this works, how it’s gonna happen, and maybe we start to get into about the delivery but we don’t even really get into that so much. We’re really about what’s happening right now. Jill DeWit: Then one thing we never really look for is what to do when the baby’s actually here. We all skip over that part like, “Oh yeah, shoot. I didn’t think about that part. I was so focused on this part.” So thank you for asking these questions, and thank you everyone for thinking about what to do after the baby is actually here. Steven Butala: Every time I have downtime, I don’t know why. I don’t when I picked this habit up. This is about everything. Steven Butala: My gut reaction is document what I’m doing, whether it’s film it, write about it [crosstalk 00:06:38]. I don’t know why that is. Jill DeWit: That’s interesting. That’s not what I do. Steven Butala: What do you do, enjoy it? Jill DeWit: Yeah. Heck yeah. I’m outta here. Does anybody need me? I know it’s 2:00, but I’m leaving. Just kidding. Steven Butala: That’s exactly what’s gonna happen right after this recording for me. Today’s topic, where does this business model end? This is the meat of the show. Steven Butala: When you own a business there’s two financial components to it. This is an accounting concept, and it’s actually very … I don’t know we haven’t talked about it somehow. There’s the income statement part of it, the money that’s coming in, so hopefully there’s more money coming in than goes out, and there’s the balance sheet part, this thing that you’re building and building and building and it’s got his value, right? In the simplest terms, think of a rental house. There’s the money that you make every month theoretically ’cause you charge rent. There’s expenses. You have a little bit left over. But the real juice in rental houses, the thing’s going up in value every year. Steven Butala: At the end, you sell it, so you get kind of a two for one deal. So when you own let’s say a manufacturing company, you got the money coming in every month, but you’re building this thing and the sales are going up and at the end of the thing, you could have an exit strategy and a solid thing. So, you’re building this land business. Where does your business model end? You’re obviously making hoards of money every month, hoards and hoards of money. Can you sell it at the end? Steven Butala: The easiest and best types of businesses to sell, I’ve bought and sold tons and tons of companies in my life and broke tons as an investment banker and accountant before we got into this. The best companies that you can sell have this profile. They have no real customer concentration, meaning it’s not like a government contractor where you just build one part for a helicopter and that’s it. That’s just one customer and that’s bad. You want lots of customers. Check if this business has that, tons of new customers. Steven Butala: It has diversification of products, so you’re not just making one product like that government contractor. You’re buying and selling, in our house, houses and land and you’re doing it all over the United States so you’re not subject to one economic depressive area, like let’s say Detroit, Michigan. If you don’t want to do it there, you can pack up the stuff in 35 seconds and go do it in Oregon or anywhere else you want. Steven Butala: It’s scalable, meaning you can control how much you sell or don’t sell. You’re not subject to, let’s say a convenience store or a restaurant where you have 22 tables and breakfast, lunch, and dinner. That’s it, unless you open another location. Check. Steven Butala: And then finally, the new person who buys the company is going to effectively be able to run the thing without you. Fail. That’s the problem with this business model. 95% of it’s all positive, but the new person, the person who buys this company from you and you turn over all your social media accounts and give them the usernames and passwords to everything and you teach them how to do a mailer, it’s still you. Steven Butala: It’s still your face. 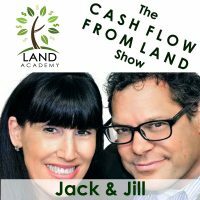 So Jill and I talk about selling Land Academy. We never talked about it. I think about it. Jill DeWit: We’ve never talked about it. Steven Butala: We’ve never talked about it and never will. Jill DeWit: Don’t worry. Yeah, don’t worry. Steven Butala: Land Academy will not ever get sold. Steven Butala: So an institutional buyer who’s got tons of money might come to you and say, “We buy apartment buildings in Illinois and I don’t think we’re doing it right anymore. We want to buy your company, but we want to have you send the mail for us indefinitely, and let’s sign a contract so you’ll be a full-time consultant for us,” and I don’t know. Steven Butala: So you can sell it. You can also franchise it. There’s all kinds of stuff you could do. But it is not a very good business. The balance sheet part of your land business is not typical for a business owner. Steven Butala: The income statement, in my opinion, and this is why we do this for a living, more than makes up for end of the business model. Jill DeWit: Right. Is it my turn? Jill DeWit: I took this topic and I wrote down kind of a roadmap of what I see the majority of us doing, us included. So where does this business end? I just took it like, where would I end? What’s gonna happen for me in the next couple years? How is this gonna change? I’m not gonna keep doing buy for 500, sell for 2000. I will die. Somebody will die. I can’t do that, right? Jill DeWit: Exactly. Something’s gonna happen. You can’t do that. You can’t sustain that. So, what’s the roadmap? So I say and what we do, as you progress and move along, you might stay with your same property type. We have so many members that just love land. This whole house thing? Who cares. Don’t want to do it. Don’t want to do it. Don’t want to do it. They love land. Jill DeWit: What are they doing and what have we done? Moved onto bigger deals, either larger properties or more money involved, higher dollar amounts. Usually it’s the same. Not always, but that’s what you do. So you move onto higher properties. I’m doing maybe the same number of deals, but I’m making more money on those deals. Jill DeWit: The other thing that we do … We’re diversified. We do all kinds of things, but some of our members have also moved on to other property types. Some are going to info lots and said, “I’m done with that. I want to do this, and then when I’m done with that, I’m gonna do the house thing,” whatever it is. They move on to other property types. That’s how you can grow your business, make more money, and be profitable. Jill DeWit: And then the very end, though, you said this and I love it, you can replace yourself with a lot of the tasks but there’s some things you can’t do. You can’t replace yourself, like you just said. The mailer, your face. You’re the front whatever [inaudible 00:13:13]. So there’s some key tasks that you still want ’cause you want this to keep going. Steven Butala: Yeah, and so should you. Steven Butala: Pass on the tribal knowledge if your kids are into it. Jill DeWit: Exactly. So, maybe then we will be backing out of it, but it will still be our family, our business, and it will go on hopefully forever. Steven Butala: For the sake of argument, if you’re the kind of person who’s interested in an exit strategy when you start a company and you’re kind of shaking your head trying to figure this out, where the exit is, here’s what you might want to do. So when you buy a piece of property and you sell it, you have a bunch of dough, you’re converting money into land and back into money. Steven Butala: … for nothing, because you’re using the profit margin from the last sale. Steven Butala: There’s lots of ways to save for retirement. Steven Butala: That’s a real good one. Steven Butala: You have complete control over this. Steven Butala: Well, you’ve done it again. 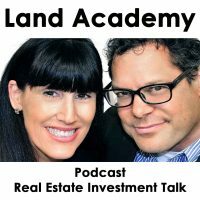 You’ve spent another 15 minutes or something listening to the Land Academy Show. Join us next time, where Jill and I interview Justin Sliva on Finance Friday. 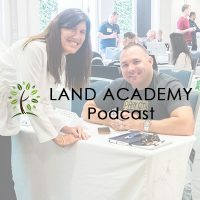 Jill DeWit: Yeah, and we answer your questions posted in our online community, landinvestors.com. It’s free. Steven Butala: I love talking property. Steven Butala: Oh, you know what I didn’t mention? There’s no law against selling two companies either. Steven Butala: … there’s other companies that are out there that are great balance sheet companies. Steven Butala: Like a Christmas tree farm. You don’t really make any money doing that, but long haul, it’s really good. Jill DeWit: Exactly. That’s good. Steven Butala: I say that jokingly. Christmas tree farm. Jill DeWit: I don’t think that’s crazy. Steven Butala: Another good non-cashflow company would be real estate in very expensive areas. They don’t make any money, but they accumulate in value. We live in a neighborhood that pretty dramatically accumulates in value but the rent to market, you can’t charge rent on a flat $5 million house. You’re gonna charge $20000 to make it work. They don’t just rent out well. But, the long haul on those houses, if you’re making 8% on a balance sheet, you’re looking at 8% of an increase in value on a balance sheet over a year, on a $4 asset, that’s awesome. Jill DeWit: Exactly. Wherever you’re watching or wherever you’re listening, please rate us there. We are Steve and Jill.